Confession: I have trouble talking publicly about Christmas until there’s snow on the ground. This is unfortunate, and unlike my smart friend Gina, who has been doing a Christmas Countdown for weeks already. But yesterday, the magic came… and oh, does it look pretty as it falls! One year we pooled money to help my brother and his wife fly home from far away. Once we played A Minute to Win It and said the winner would get the money pool–secretly planning to donate it to the couple who’d been through a lot that year, and give them a vacation together. Last year, Ryan and I brainstormed a traditional gift exchange, with one stipulation. Christmas is three months away! And while I’m not into singing Jingle Bells just yet, I did want to let you know what Ryan and I have in mind, so you can start brainstorming. I guess it’s our turn to be in charge this year. We batted around several ideas (donating money to the poor in a foreign country to buy pigs or goats or something; pooling money to do a group activity together—) and finally settled on an idea we really like. We want to do a traditional gift exchange, with the stipulation that the gifts must be original—made, designed, or modified by the giver. Don’t panic. You don’t have to turn into a “crafty” kind of person to participate; each of you is already good at making something the rest of us aren’t, so think outside of the box and be yourself. Use your imagination, but please don’t overwork, overspend, or overstress. You may help your child as much as you want. I made a list of ideas to get you started thinking. Before we exchange names and send the results to you, do you have anything to say? Any curses, questions, or complaints? Two months later, excitement was running high. Gifts were being planned and produced, secreted and stashed in every dark corner. Here’s our list of suggestions. A homemade book, made by slipping photos of your own into an album or CD case [see tutorial here]. You could make a memory book, an advice book, a grandma’s-brag-book, or a recipe book! Do you give handmade gifts at Christmas? How do you coordinate your extended-family holidays? I’d love to hear your ideas! Next time I post, I’ll share some specific gifts we made, with pictures. You had snow! My children would be so jealous. 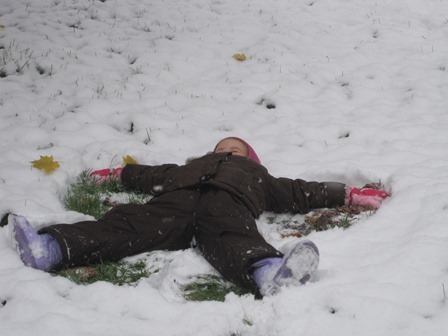 We had a tiny amount of slushy rain yesterday and the children raided the closet, pulled out all the snow gear, ran out shouting – and were disappointed that it didn’t turn to real snow. I love homemade gifts and love your list! I think I’ll print it for future reference. I so want to do this…not sure if we have time anymore to pull this off completely but I want to encourage this creative thinking…thanks for the input. I am compiling a folder for future reference..and your list made it in there! We’ve done this and loved it! So fun!